TenderfillTMnon woven wadding is the first choice for exporters of home furnishing , garments , safety wear and accessory manufacturers. These are fire retardant and ideal for high performance work in a variety of industries. Times Fiberfill has created an unique nonwoven product that provides protection to wearers in tough conditions. Tender touch® offers various kinds of nonwoven, hi-performance glove liners which are soft, sweat absorbing and safe for use in all types of leather gloves. Special properties such as Fire retardancy , anti-static, anti-microbial, cut resistance can be imbibed in our lining materials wby using certified raw materials from reputed brands such as Nomex, Kevlar, Protex etc. Lining fabric can be made extra sweat absorbing by adding special cellulosic fibres which easily absorb the additional sweat. Our range of lining fabric are easy to use , are available in roll form, multiple thicknesses/weight and also are easily stitched on to the leather. Our range of winter linings are used in winter gloves by manufacturers to provide thermal insulation along with superior sweat absorption. Kindly contact our sales team for more information regarding our range of glove linings. 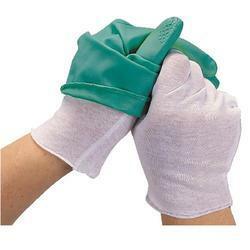 Substitute for Chinese fur , flannel and conventional lining materials for gloves. Same consumption of leather as compared to flannel and fur. Hiloft Polywool is an thermally bonded polyester fibre wadding.It is a smart choice for partition infills in commercial and residential buildings.The material is light with higher air entrapment made possible by the manufacturing process which requires less thickness of insulate compared to other available products.The material is also completely non toxic, itch free and human friendly. TENDERfillTM Polyfill is the first choice for exporters of home furnishing , garments , safety wear and accessory manufacturers. TenderfillTM nonwoven wadding is the first choice for exporters of home furnishing , garments , safety wear and accessory manufacturers. These are fire retardant and ideal for high performance work in a variety of industries. Times Fiberfill has created an unique nonwoven product that provides protection to wearers in tough conditions. Additional qualities:· Breathability· Mechanical Electro-static performance· Customized design and colours· Resistance to wide range of chemicals and radiation· Maximum comfort of wearer We provide: Chemical Bonded wadding with option of silliconised fibersThermal Bonded Wadding with option of silliconised fibers We provide a wide range of fibers to choose from: PolyesterModacrylic (safety wear , insulation)FR Polyester (safety wear , insulation)Cotton (for home furnishing , bags etc)Wool (natural FR) We can make wadding / batting as per FMVSS 302 , UL 94 , EN 532 among others.Weight of the fabric can be from 40 to 1000 GSM. 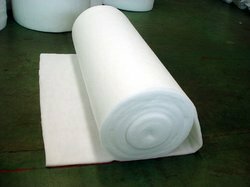 Looking for “Tenderfill Nonwoven Wadding”?